This is a simple, delicious, and versatile recipe. I like to use boneless chicken thighs rather than breasts because I think they hold up to a long marinade a bit better, and they’re also more flavorful and much more forgiving if you happen to slightly overcook them. Of course, they’re also much less expensive than boneless skinless chicken breasts, so it’s a win all the way around, especially if you have big eaters like we do in our house! In a large container or disposable zip-top bag, combine the juice of the orange, lemon, and lime. Once you’ve squeezed all the juice from the citrus, throw the fruit directly into the bag as well. Add the honey, onion, coriander, salt, pepper, and olive oil to the citrus. Stir or shake to combine. Put the chicken thighs into the marinade and either turn the whole thing around with tongs a few times, or squish your zip-top bag to evenly coat the chicken and distribute all the flavors. Let the chicken sit in the marinade, refrigerated, for 8-10 hours. When you’re ready to cook, take the chicken out of the refrigerator and begin heating your grill – you want a moderate flame. 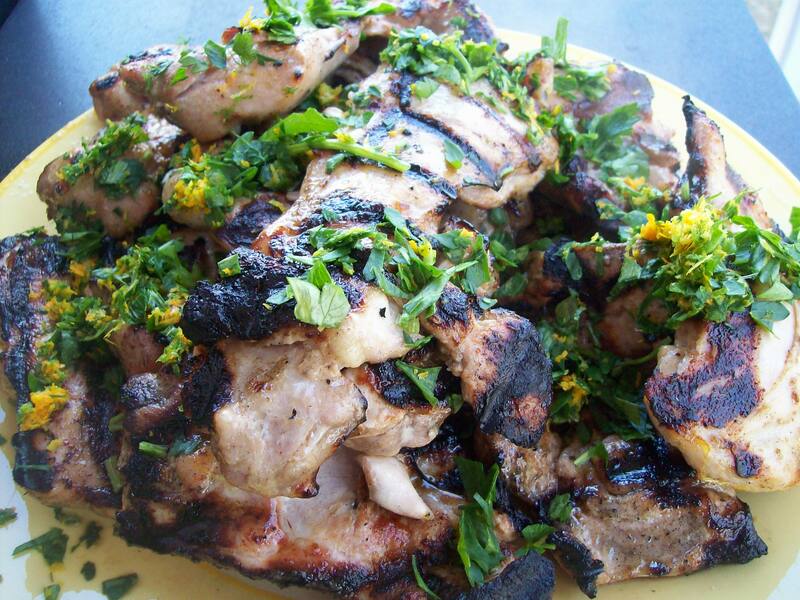 Grill the chicken thighs for about 4-5 minutes per side, until they’re cooked through. 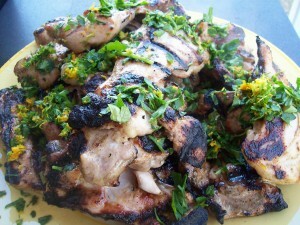 Transfer the cooked chicken to a clean platter and sprinkle with the parsley and citrus zest. Let the chicken rest for 5-10 minutes before serving to ensure that it retains its juices.